March is National Peanut Month! ft. Peanut Butter & Co. Courtesy of Peanut Butter and Co. Since 1974, March has honored America’s favorite (not actually a nut) nut: the peanut! Whether roasted, ground, or used as cooking oil, peanuts have become a big part of American cuisine. Peanuts are actually legumes in the same family as beans and pack a lot of nutrition in one serving. They are a great source of muscle building protein, heart healthy monounsaturated fats, disease fighting vitamin E, and essential B vitamins. Since 1998, Peanut Butter & Co. has been dedicated to helping the world find delicious new ways to enjoy peanut butter every day! 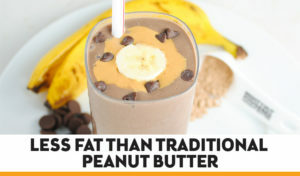 Mighty Nut ® Powdered Peanut Butter keeps the protein and delicious peanut taste while reducing the fat and calories. Mix Mighty Nut with a little water and use it as a spread or a dip for fruit or veggies, add it to your favorite smoothie, and or use it for your low calorie, high protein, and gluten free baking needs. You can find more recipes by visiting them here. Also, keep checking out our blog for new recipes every week!